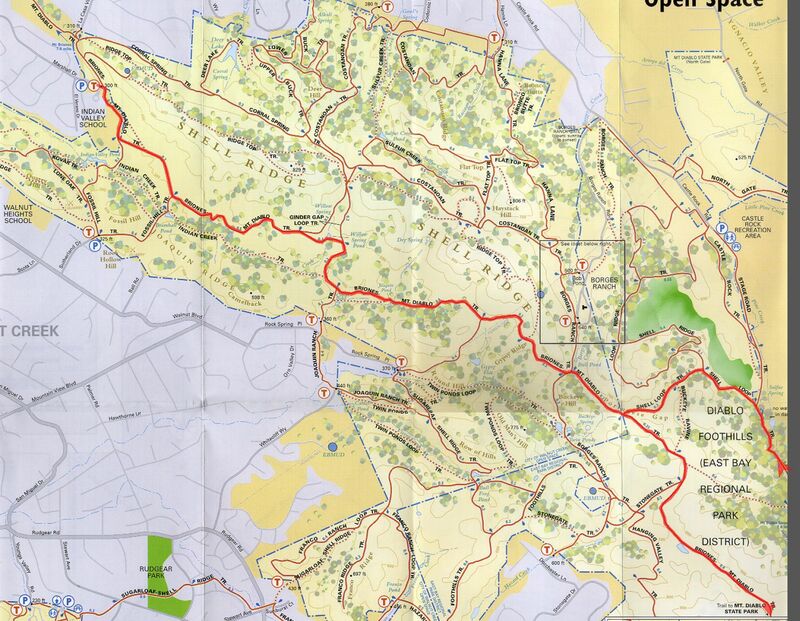 This ride takes you from neighborhoods on the fringes of Walnut Creek all the way to halfway up the South Gate Road climb of Mount Diablo and then brings you back down while following a different set of trails for most of the return. The climbing part of the ride could be considered to consist of two halves, the first half maintaining relatively reasonable slopes most of the time and a second half that starts around the 5-mile mark that is more brutal. The return of the ride isn't completely free of effort either, but the more distinctive aspect of the descent is very high interaction with water. The ride is also quite a scenic one. There aren't too many long views available in the early part of the ride, but the uniformly grassy, rolling hills that surround you in that area and the very light sprinkling of oak trees add up to a setting that looks as if it were artificially landscaped to be pretty (especially during the spring). Soon after you get to the tough part of the climb, wider panoramas and much longer sightlines start becoming available. These views continue on and off until you start your descent on Barbecue Terrace Road. The best views on the ride are probably those that you will catch from South Gate Road. Then, when you start descending on Barbecue Terrace Road, it initially swoops down into a small, bowl-shaped valley very quickly before losing enough elevation and gaining enough tree cover to obscure the views. The first couple of minutes of the descent on that road are thus done against much of that same scenic backdrop as well. Shortly after that, the trail is tucked into the bed of Pine Creek and does not return to an open-feeling setting until you (leave the creek behind and) return to the grassy hills through which you traveled near the beginning of the ride. Another thing you can expect to find on this ride is cows. The reason the lower hills can look so golf-course green is that they're constantly "mowed" by grazing cows. This means that you'll encounter your fair share of cowpies, and also that the trails could be pretty pockmarked if you ride here at the beginning of the dry season. Of course, if you ride here while it's wet, you can expect it to be pretty muddy, too. Like I already mentioned above, the second half of the climbing portion of this route is a lot worse than the first half. Over the first 5 miles on the ride, you incur a total elevation gain of 1200 feet. In the 4.5 miles that follow that, you add 1700 feet to this. Those tough 4.5 miles begin right around the junction of Wall Point Road and Dusty Road, and the first half mile after that is the worst of it. 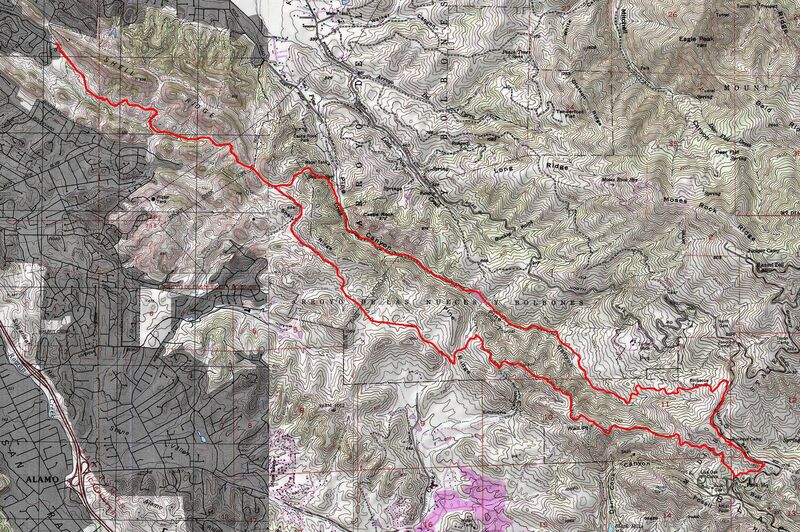 The trail climbs at an overall average grade of 13% over that stretch, with seemingly no break in the mix. There is never another unbroken steep stretch that long for the rest of the climb, though you do flirt again with grades in the range of 18% once or twice. The ride saves one special treat for the return portion of the route: I've counted 15 stream crossings over a 2.5-mile stretch. Other than one crossing in the final stretches of Barbecue Terrace Road, all of these arrive on Stage Road. All of these small to medium-sized crossings had flowing water when I last did this ride in a January. It doesn't end there either. In addition to those 15 crossings, there is a roughly 500-foot stretch of Stage Road where the trail merges onto the creek itself. Just to make it perfectly clear, I'm not talking about a crossing or a fording of the creek, or edging along the water here. Essentially the creek bed becomes the trail and you ride literally on the creek bed through this stretch. If I had to pick one thing that is the highlight of this ride, this short stretch would have to be it. I've only been on this stretch of Stage Road once in a January and twice in March on different years and there was always flowing water here, but it was no more than a couple of inches deep. I'm not sure if you can expect it to be any less or more than that at other times of the year. Those who may be interested in an easier version of this route will be glad to know that there is a simple way to reduce the physical difficulty of the ride. If you just turn onto Dusty Road from Wall Point Road and follow it to Stage Road, you can then follow this latter trail all the way back to the beginning as shown on this route. This will reduce your overall ride length to 11 miles and limit your total climb to 1800 feet. On top of that, you still get to ride through most of the fun stream crossings on Stage Road if you do this, including the part of the trail where it merges with the creek. However, this does mean that you'll miss the most expansive views one would catch on the longer ride. If, on the other hand, this ride leaves you wanting more, you will have a long list of extension possibilities available to you due to the fact that the route is located within an interconnected trail network that spans an area from Walnut Creek to the Los Vaqueros Reservoir. Many of these extension options will typically involve plenty of steep fire-road climbs and descents. If your main interest is the fun of riding, you might consider adding a little bit of sweet singletrack mileage to your ride by working in one or two of the singletrack segments included in the "Mothers, Diablo Ranch, Buckeye Trails" ride route listed on this site. On the other hand, if the scenery is what impresses you the most, my top recommendation to those who have the energy would be to continue to the summit on South Gate Road (followed by Summit Road) before returning to Barbecue Terrace Road to resume your return descent as shown on this route.